The vendors’ notes for Epworth House when it was advertised for sale in 2011 said that the body of the house was built about 1670 and the brick built extension that is now the kitchen was added in 1730. We have no information as to the reasons for suggesting these dates. The notes also indicate the following details; the remains of a second staircase up into one of the bedrooms is visible in the cupboard to the family room, there is evidence of a bread oven in the garage and what is now the garage may have been an entrance to the courtyard behind. It is often said that John Wesley stayed in this house or that he preached there. We have not seen the evidence for this. 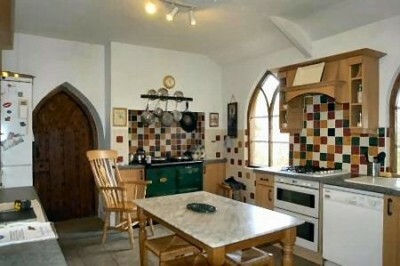 However previous owners, Kenneth and Anne Smith said that the old stone flagged kitchen floor showed “clear marks of the feet of about five rows of pews”. These marks are no longer visible as the floor was then tiled over. It is certainly hard to find evidence to confirm the common belief that part of the house may have been a chapel. This evidence is based mainly on the shape of the door and windows in what is now the kitchen. It is unlikely that Wesley did preach here. Certainly this property would not have been a chapel as such at the time but a barn, stables or similar building that was part of the older building next door, Wigmore House. John Wesley’s diary records that he made at least five visits to Thornbury. Two of these in 1739 were specifically described as in the open air and one in 1789 was in “neat and commodious meeting house” in what became known as Chapel Street. We do know that John Wesley did visit Ralph Grove when he stayed in Thornbury and in that instance he would have stayed at what is now 11 St Mary Street. In more recent times the house (as can be seen from the photograph) became a very substantial home. In 1872 on December 21st a newspaper carried an advertisement for the sale by auction of this property (then lived in by George Godwin) which was to take place on 3rd January. The notice said that the house had a large dining room, parlour, kitchen, scullery, two water closets, four bedrooms and two attic rooms. The house also had a stable for four horses, a coach house and a yard. It had a cellar and ‘both sources of water.’ This could be water from a well and water from a cistern, although very soon after this time we know that it referred to being supplied by cistern water and piped water, which may have come from the railway. The biggest change that has occurred in the appearance of this house is the distinctive porch and window over it. This appears to be very much a twentieth century addition. We have an extract from a postcard here dated 1910 which shows what the house looked like before this porch was added. Click on the thumbnail image below right to see the photograph of that part of Castle Street with a very different looking Epworth House. The black and white photograph at the top of the page is taken from a postcard sent by Mabel Sainsbury who lived in the house in the 1930s. The coloured photograph below it was taken in 2010. This shows that the house, although modernised and a little extended, remains basically the same, although of course the railings were removed during the Second World War. The Fewster family had a connection with the building for many years. George Godwin. The 1861 census shows that George Godwin was a veterinary surgeon who was born in Dodington. At the time of the census he was aged 44 and he lived with his wife Mary Ann Godwin then aged 45. Mary Ann was born in Latteridge. They had a young servant, Hester Vaughan aged only 13 to look after them. The trade directories show that George Godwin had been a veterinary surgeon in Thornbury from at least 1849. The 1851 census shows that George had previously been living in another house owned by George Fewster, which is now number 9 Castle Street and called the Lion House. At that time he was a widower and he had a visitor Elizabeth (whose surname may have been Goring) staying with him. On 5th April 1854 George Godwin married Mary Ann Gunter, the daughter of William Gunter. Mary Ann had been living at the White Hart public house with her brother who was the publican George Gunter. The censuses and rate books indicate that George and Mary Ann Godwin continued to live at Epworth House for some time. By the 1871 census George was aged 53 and his wife Mary Ann was 54 and the census now says that she came from Alveston. In this census they have an assistant vet living with them. He was George Paradise Mallett aged 23 from Berkeley. They had another maid Emma Hughes aged 15 from Tytherington. On 31st October 1863 George Godwin borrowed £180 with interest from George Nelmes Leonard to enable him to buy Epworth House which he had already occupied for a number of years. The documents for the transaction show that Dr Long had defaulted on his payments and failed to become its legal owner. In 1873 an indenture between George Nelmes Leonard of Browns Mill, Berkeley, George Godwin and Henry Knapp referred to an earlier agreement made on 31st Oct 1863. It showed that there was still £180 of the amount borrowed on mortgage against Epworth House due to George Nelmes Leonard. George Godwin now agreed to the sale of the house to Henry Knapp for £409. From this sale £180 had to be paid to George Nelmes Leonard and £229 to George Godwin himself. George Godwin died in Alveston aged 57 on 2nd February 1874. The probate record describes George as ‘formerly of Thornbury but late of Alveston’. In the 1881 census Mary Ann Godwin was staying with her late husband’s assistant George Paradise Mallett and his mother Elizabeth Morgan at 18 Gloucester Road. The 1885 rate book shows that she then moved to 14 Gloucester Road. Stephen Henry Applegate. Mark Savery and Samuel Mullett Wilmot acting as trustees for the estate of the late Henry Knapp sold the house on 30th March 1883 for £350. The purchaser of the house was Stephen Henry Applegate, a retired baker and cornfactor. However his daughters Charlotte Nelmes (a widow) and Mary Ann Earl (who then lived in Lower Broughton in Manchester with her husband William) paid five shillings each to their father at the time of the purchase and this made them the legal owners of the house. At the time of the sale it was said to have small entrance vestibule, two sitting rooms, kitchen, scullery, two pantries, cellar, four bedrooms, two attic rooms, a lumber room, stabling and hard and soft water. We believe that Stephen Applegate was born in Westbury in Wiltshire on 2nd April 1805 and baptised on 6th September 1812 at Old Meeting Independent Chapel. His parents were Thomas Applegate and his wife Sarah. The 1841 census shows that Stephen Applegate was a baker in Westbury Wiltshire. He was then aged about 35. He was living with his wife Mary and three children; James aged 11, Mary aged 10 and Charlotte aged 8. The 1842 Pigot’s Trade directory shows that Stephen was a baker on the Warminster road in Westbury in Wiltshire. By the 1851 census Stephen had become a baker and publican. The family then lived at the King’s Head Inn in Westbury and the notes on the Census record seem to indicate that Mary was the licensee. The census makes it clear that their children, James then aged 20 and Charlotte aged 17, were both born in Middlesex – James in London and Charlotte in St John’s Wood. In 1857 Stephen and Mary’s daughter, Mary Ann Applegate married William Earl in Westbury. 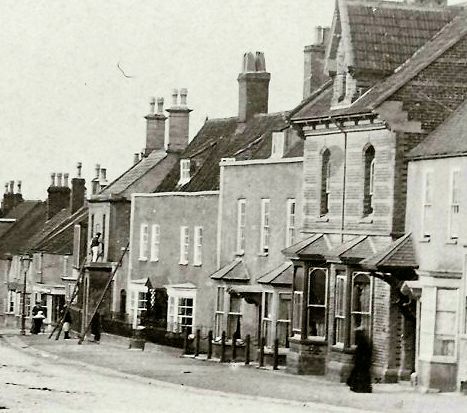 The 1861 census shows Stephen had moved to Thornbury and he was living at 49 High Street. He was a baker aged 57 and Mary Ann was aged 63. Their daughter, Catherine aged 25 was living with them. She was born in Paddington. We believe that Catherine might have been the same daughter called Charlotte in other records. On the 11th February 1869 their daughter Charlotte Applegate married Thomas Nelmes aged 46, in Bristol. On March 1st their son James died in Thornbury at his parents’ home at the age of 29 years. He was buried at Thornbury Baptist Church. In the 1871 census Stephen was a grocer aged 64 and his wife Mary Ann was aged 70. They were living with their son in law, Thomas Nelmes aged 45 who was Stephen’s assistant in the bakery business and his wife Charlotte who was said to be 34 and born in London. Stephen and Mary Ann had a grand daughter Alice Earl living with them. She was aged 10 and born in Liverpool. Initially Stephen and Mary rented 49 High Street in Thornbury from Mrs Surridge but by 1880 they had bought the property. By the 1881 Census Thomas Nelmes had died and the widowed Charlotte aged 47 was living on income from land. She was living with her parents in the High Street. At this time Stephen aged 77 and was still a master baker. His wife Mary was 83. The 1885 rate book shows Stephen had retired from the shop and was letting it to George Witts. Stephen was also renting out Epworth House to John Thomas Buckley. Stephen and Mary were living at 50 High Street as tenants. Stephen died 3rd March 1887 aged 83. Mary died in 1888 aged 90. Charlotte Nelmes then living in Westbury in Wiltshire owned Epworth House with the heirs of her late sister (Mary Ann’s husband William Earl and her son Edward Earl ) until it was conveyed to David Cogswell Ovens on 31st October 1900. In the census of 1891 the property was still tenanted by John T Buckley and his family. At that time the house was unnamed. Click here to read more about John Thomas Buckley and his family. In 1894 the rate book shows that the new occupant of the house was the Rev John Stephenson and the owner was Charlotte Nelmes. The trade directory of 1899 has an entry for the Rev John Stephenson and gives his address as “Providence House.” We know from the Special Drainage Book of 1899 that the Rev Stephenson was living in the house in Castle Street said to be owned by Charlotte Nelmes and so it is certain that “Providence House” was the name at that time for Epworth House. By 1900 we know that Charlotte Nelmes was living in Westbury in Wiltshire. On 31st October 1900 she and William and Edward Earl sold the house in Castle Street to David Cogswell Ovens (see below). John Stephenson was a Wesleyan minister. In 1894 the rate book shows that he was the tenant of Charlotte Nelmes in what is now Epworth House, but he appears to have moved out when the house was sold. By the 1901 census he had moved to Stonehouse in Gloucestershire. The 1901 census shows that John Stephenson was 65 years old and born in Birkenhead in Cheshire. His wife was 58 year old Emma, from Bebbington in Cheshire. Living with them were two of their children, 24 year old Jeanie who was born in Bath and Amy aged 25 who was born in Baildon in Yorkshire and who was a teacher of music. Although we cannot confirm this, it seems likely that John was the child of Eliza Stephenson and her husband William, who was a master mariner. The 1851 census shows that although John Stephenson was born in Birkenhead he was sent to Whitchurch Grammar School in Shropshire, where he was a boarder. We believe that it is possible that John Stephenson married Emma Mathews in Birkenhead in 1867. In the I871 census John was away from home and his wife Emma was living in St Just in Cornwall with her two little sons, John aged two and Charles aged seven months. They had another Wesleyan minister Robert Morgan Williams from Bath staying in the house. In 1881 John Stephenson was in Norfolk, visiting another minister Frederick Moseley from Yorkshire. The 1891 census shows that the family lived in Totnes in Devon. At this time they had three daughters living with them. Jeanie and Amy had a younger sister Eliza, then aged 12 and like her elder sister she was born in Bath. Arthur Jackson was the tenant of Epworth House in the 1901 census. At that time he was a 32 year old Wesleyan minister living with his servant Martha Ball. Arthur was born in Leek in Staffordshire. Joseph Sainsbury. Joseph Sainsbury a house decorator bought Epworth House, the coach house and the outbuildings on 10th December 1913 from the holders of the mortgage, Emma Alpass and George Witts, and the executors of D C Ovens, William Walton, then a bank manager in Richmond Yorkshire and William Canning, the solicitor. 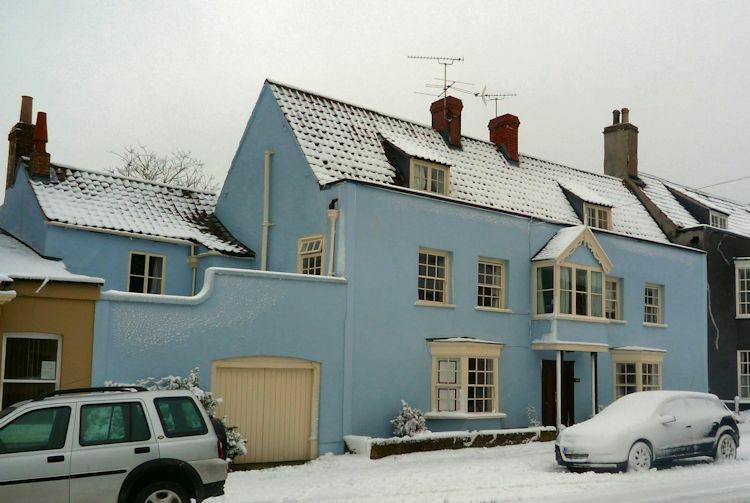 Joseph bought Epworth House for £450 with the help of a mortgage from Thornbury Permanent Benefit Society, the registered office of which was the Castle Hotel in the High Street. The Western Daily Press of 24th April 1917 shows that Mabel Wilmott nee Sainsbury died in this property on 20th April and was buried on 24th. We assume that either Austin and Mabel Wilmott were living with her parents in this house or that Mabel had come to live with them when she became ill. The house was advertised in the Western Daily Press to be auctioned on the 26th April 1949 as part of the estate of Mrs E Sainsbury deceased. We have an image of the advertisement here on the left with the detailed description of the house at that time. Archibald, Olga and Mina Bennell appear in the electoral rolls of 1950 and 1954. The house was bought by Miss Olga Annie Guthrie Bennell a school teacher of Greengates in Filton on 27th July 1949 from William Wall. The name is unusual and we have only been able to find one Archibald Bennell in the 1901 census. From census information alone it is possible that Archibald was born in Thame in Oxfordshire in 1880 and was the son of Frederick William Bennell a grocer. The 1901 census shows that Archibald Frederick Bennell was a boarder in Wolverton Buckinghamshire. He was a railway carriage body maker aged only 14. By 1901 Archibald Fredrick Bennell had moved to Wandsworth in London. Archibald died in Bath in 1957 aged 70 and Mina also died there in 1966 aged 82. We have been lucky enough to hear from a former pupil of Olga Bennell who taught English at Bath Technical College in the early 1970s. We are very grateful for the following information as it hints at an intriguing story. We have learned that Archibald and Mina Bennell married on 5th August 1912 in the District of St. Andrew, Dundee, Scotland. They gave their address as 36 Forfar Road. Olga was born while her father was working as a mechanical engineer in St Petersburg and his wife Mina was a nurse. We understand that Olga would have been born in 1913/1914. It would be fascinating to find out more about their life in Russia at that time and the circumstances in which they left. There is a death of Olga Bennell, age 95, in 2009 in Forfar, Angus. Jean and Michael Nedham. The deeds of the house show that Michael Alfred Nedham of Kyneton House bought Epworth House on 17th December 1954 from Olga Anne Guthrie Bennell. We have found a record of Michael Nedham marrying Jean Haynes in 1946. Michael Nedham was a mechanical engineer and he worked for Aerospace in Bristol. The 1958 and 1961 electoral rolls say that Epworth House was occupied by Jean and Michael Nedham until they sold the house in June 1962. Alan John and Beryl Darton. We have heard from Richard, the son of Mr and Mrs Darton, that they bought the house from Michael and Jean Nedham on 7th June 1962. Alan Darton worked on the construction of Oldbury Nuclear Power Plant for Sir Robert McAlpine. He heard from a colleague at work that the house was to be put on the market. He immediately went around to Epworth House to ask about it. Mrs Nedham was very surprised as she had only mentioned the possibility in confidence to two close friends! Thornbury still has an excellent “grapevine” system for information. We understand that the Dartons sold the house on 13th October 1965 and moved to Coventry Road, Narborough in Leicestershire. Kenneth Newton Whittall of Heybridge Maldon in Essex bought Epworth House in October 1965. William Arthur and Fay Gwendoline Eva Holdaway. On 17th April 1968 Kenneth Newton Whittall sold Epworth House to William Arthur and Fay Gwendoline Eva Holdaway for £7,000. Diana Hendry says she bought the house from Mr and Mrs Holdaway who had a fishmonger and greengrocer’s shop. The address of Mr & Mrs Holdaway at the time of the sale was 1, The Plain. Click here to read more about Mr and Mrs Holdaway. Kenneth Alan and Anne Miriam Smith. The deeds of the house contain land registry documents dated December 1986 for Kenneth Alan and Anne Miriam Smith of Epworth House. Martyn and Suzanne Leighton bought the house in 1998. They moved to Oxford in 2011.